(NOTE: The Samuel French (London) version is not available in the USA or Canada. Now available in an Italian translation "Quando La Morte Chiama" by Pino Tierno. The above email address is a graphic so that SPAM email harvesting programs cannot see it. You must manually type in the email address! Thanks! 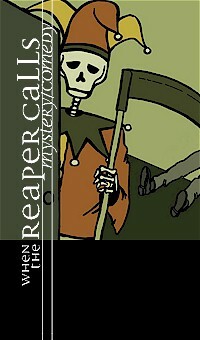 PROFESSIONAL PRODUCTION HISTORY: WHEN THE REAPER CALLS has been produced in 9 countries. It premiered at the Gryphon Theatre in Ontario, Canada (a 700-seat Equity theatre), and was later produced at the Victoria Theatre, Ontario. 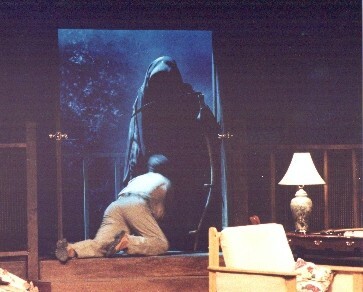 In 1998 a revised version premiered at the Upper Canada Playhouse, and The Abaiq Theatre in Saudi Arabia and theatres from Alberta to Nova Scotia. 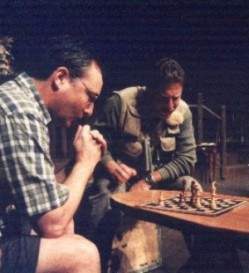 In 1999 it was produced at the Blyth Festival (where the entire run sold out), and the Port Carling Summer Theatre. 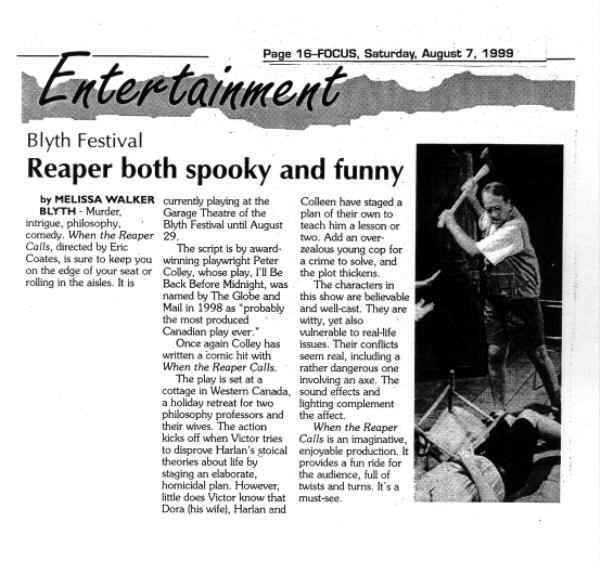 In 2000 the play was remounted at The Blyth Festival to accommodate the audience who could not see the sold out run in 1999. 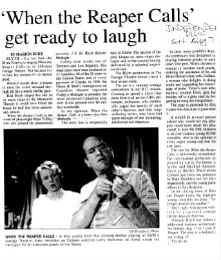 In 2001 The west coast premiere was produced by a co-production at the Western Canada Theatre Company in Kamloops and the Gateway Theatre in Vancouver, British Columbia. 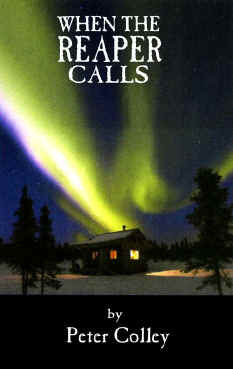 In 2002 the play was produced at several theatres including the Showboat Theatre and the Collingwood Summer Theatre in Ontario. In 2003 the U.S. premiere took place at the Fort Gordon Entertainment Centre and in 2004 the English Theatre of Hamburg presented the German premiere - a long-running hit that grossed over $100,000.00. 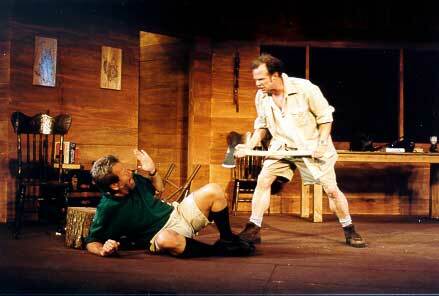 There have been numerous other productions and in 2006 it was presented at the Sudbury Theatre Centre and was published in London by Samuel French Ltd. Also in 2006 the play won 4 awards at the Western Ontario Drama League's annual festival in Canada. There were two productions in New Zealand in 2009 (The Dolphin, Aukland, and The Whangerie) as well as the Dundee Playhouse and The Abbey Theatre (2010) in Scotland. 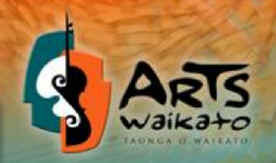 The Whangerie production won 4 2010 NZ awards, including "Best Comedy". In 2011 it was presented at The Lighthouse Theatre, The Meaford Opera House and the City Playhouse in Canada as well as theatres in several states in the US, including the Chicago area. In 2012 there have been productions in Rome, Italy (in Italian), Shanghai, China (in Mandarin at the Shanghai Modern Theater - Xinguang Arts Center), and in Cape Town, South Africa as well as the UK, US and Canada. There is a new Polish translation in 2015. 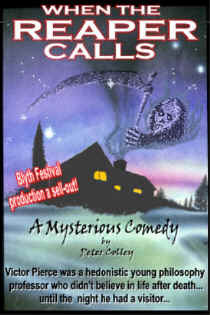 It is a very funny, yet suspenseful play, set in a summer cottage by a lake, and full of humour, thrills and supernatural goings-on. 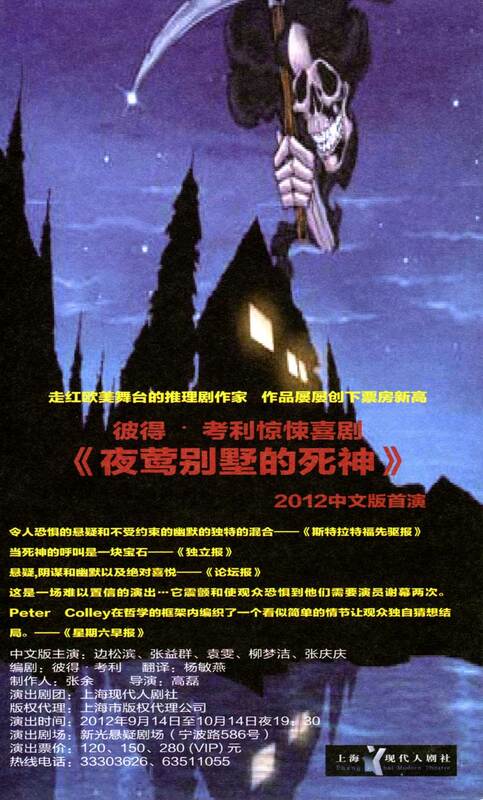 It has a universal theme which audiences have found very endearing along with a deeply satisfying and uplifting ending. It is the perfect play for Halloween or a summer's evening. 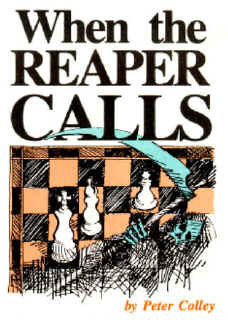 SHORT PITCH: When The Reaper Calls is a comic thriller about two young academics who are rivals over the question: "is there life after death" and how that affects the way you should lead your life. As they vacation together with their long-suffering wives their rivalry results in infidelity, murder, and lots of laughs. 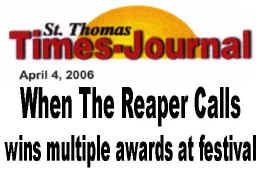 2013 - When The Reaper Calls wins a BRAVO AWARD in Canada. Also in 2012 - in Rome. Italy. Italian translation "Quando La Morte Chiama" by Pino Tierno. 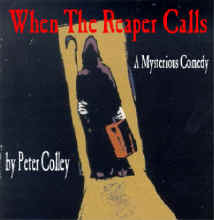 "Suspense, intrigue and humour; sheer delight"
"When the Reaper Calls it's definitely time to get your tickets to an evening of devilish hilarity, intellectual philosophizing and entertaining thrills. Coming out of the theatre into streets shrouded in mist seemed the inevitable finale to an evening full of twists, turns, scary pranks, ghosts, murder and mayhem. A chilling mix of suspense and humour this is one of the best plays the theatre has done for quite a while. It is a must-see for anyone who appreciates a hearty laugh spiced with intrigue and deception... more laughter than I have heard in the theatre for a long time. 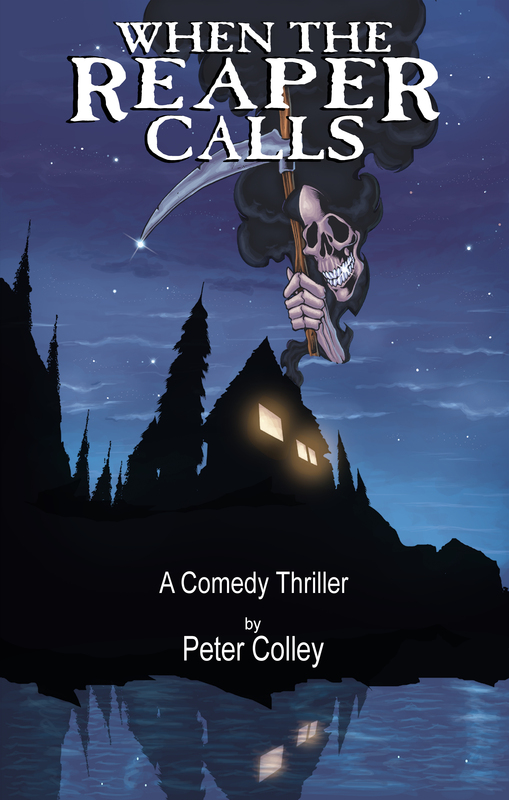 Peter Colley has wrapped authentic philosophical dialogue in a riot of edge-of-the-seat happenings, each more unexpected and more hilarious than the last. A master of language and plot he pulls us along, bewitched by the crazy turn of events until the final high-five ending. This beautifully sculpted script will keep you guessing and laughing to the end, and beyond. This is an absolute delight. Highly recommended - four out of four stars." 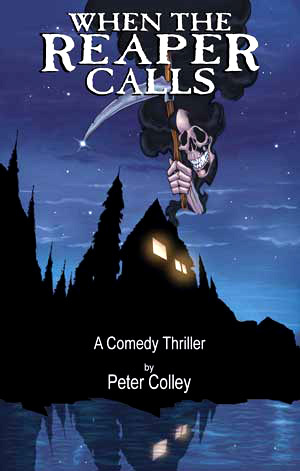 "Wittily written by Peter Colley, this intelligent comedy keeps you laughing at yourself as well as the characters. 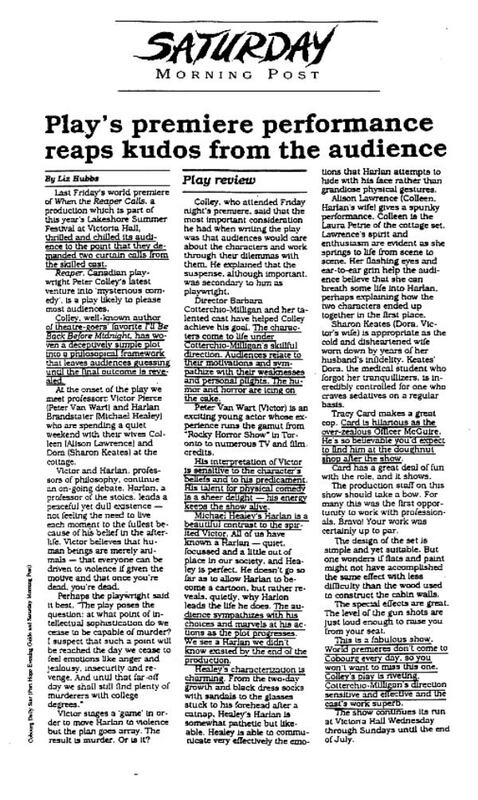 Comparisons between playwrights never is fair, but, in rare instances, unavoidable and, in this case, complimentary. Colley’s wry humour and controlled antics call to mind Noel Coward, that tireless observer of human foible. The women from Coward’s Blithe Spirit, well done at The Showboat last season, would rollick in the aisles over Reaper in this theatre. The plot is simple, as opposed to simplistic, and thought-provoking outside academia: can a stoical pacifist be provoked to violence? If so, what consequences are reaped by the provocateur? 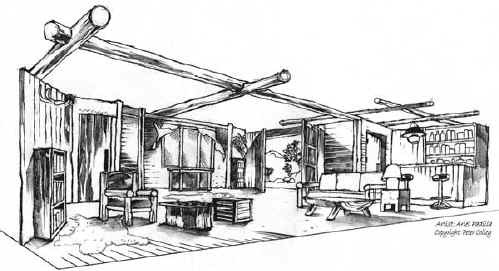 You’ll find out in this delicious, expertly staged, piece." 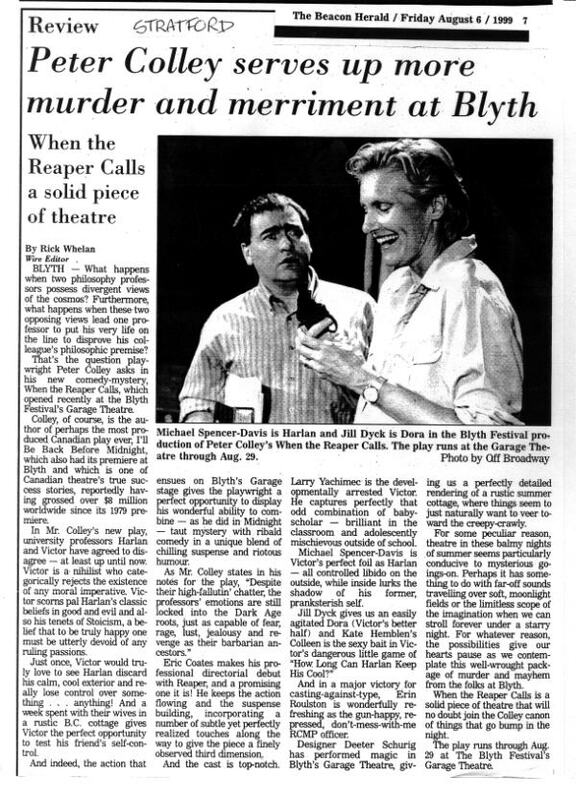 "There are lots of elements that made When the Reaper Calls, a truly brilliant play. But what stood out most for me were the refreshing and surprising plot twists of this play. The script itself deserves a great deal of the credit for making this comedy thriller so entertaining. That’s right -- a comedy thriller. 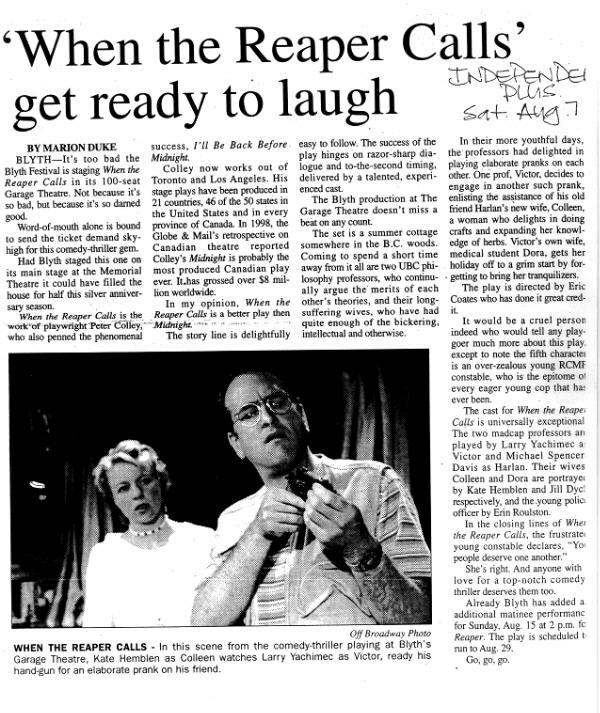 Rare is the play that combines these genres successfully, but When The Reaper Calls, is indeed equally as gripping as it is hilarious. (Act Two) is where the play turns brilliant. 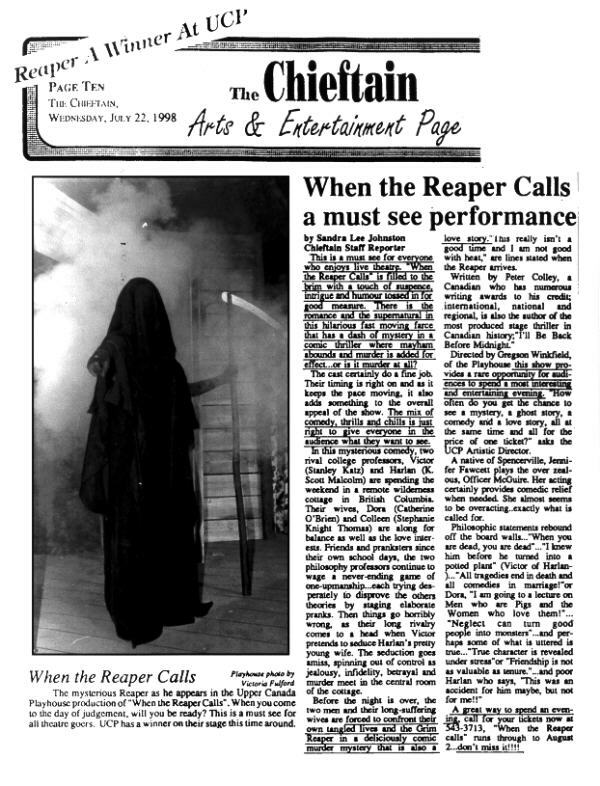 Where most summer theatre offerings would have left the story there - the interminably un-guessable When The Reaper Calls is just beginning to play head games with the audience. Just when all transpires exactly as you figured it would, the play is stood on its head, and without spoiling the denouement - which is truly the best part of this play - let’s just say that nothing is quite as it seemed. Revelations tumble out until the final moment of the final act. You won’t want to miss one moment of this play. 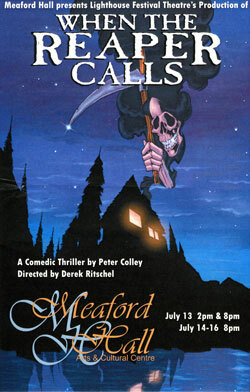 ... wonderful the storytelling... one of the most entertaining plays in the Niagara Region this summer. 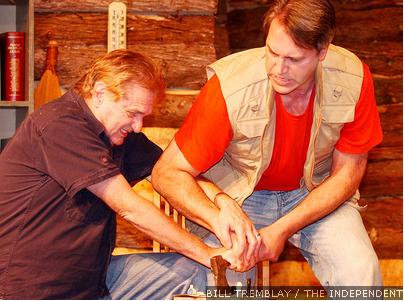 I can’t imagine that this play will be bested." 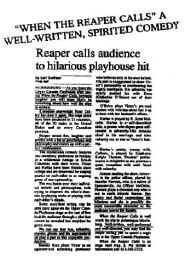 “REAPER CALLS AUDIENCE TO HILARIOUS HIT! A WELL-WRITTEN, SPIRITED COMEDY!" 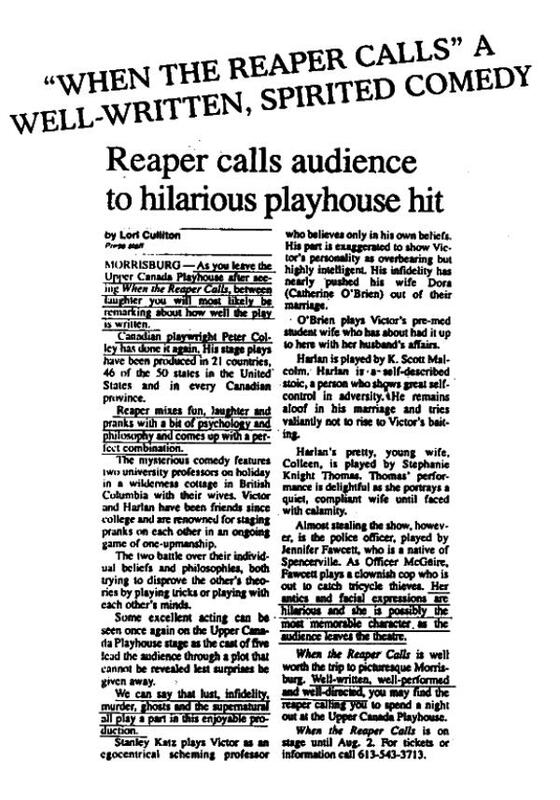 "As you leave the Upper Canada Playhouse after seeing When The Reaper Calls, between the laughter you will most likely be remarking about how well the play was written. 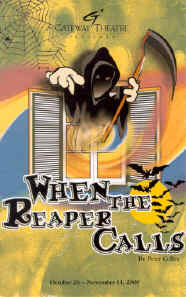 Reaper mixes fun and pranks with a bit of psychology and philosophy, and comes up with a perfect combination. Lust, infidelity, murder, ghosts and the supernatural all play a part in this enjoyable production... (The character of) Officer McGuire is hilarious and almost steals the show." 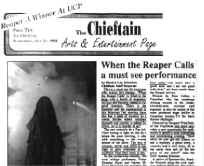 “REAPER” A WINNER AT UPPER CANADA PLAYHOUSE! A MUST-SEE PERFORMANCE!" 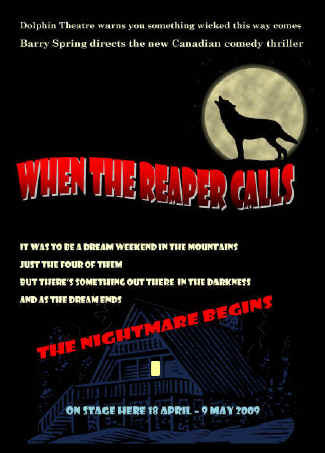 “A CASCADE OF SUSPENSE, HUMOUR AND THE SUPERNATURAL"
“Fun, scary and cultural... This wacky comedy thriller is sure to have you clutching your gut with laughter or nipping your nails in terror." "I read this script and loved it . We just finished a three week run of the show and it turned out to be a great experience for the staff, cast and audience. Large and enthusiastic houses -- and not one person claimed to have figured out the ending in advance. That's a first! " "This is a very well written play. 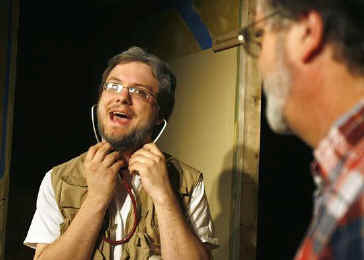 It is one of the best plays I have ever come across and has some brilliant characters." 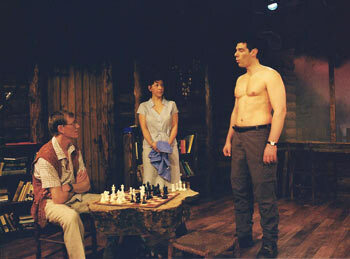 "A great play which sold out in our theatre." 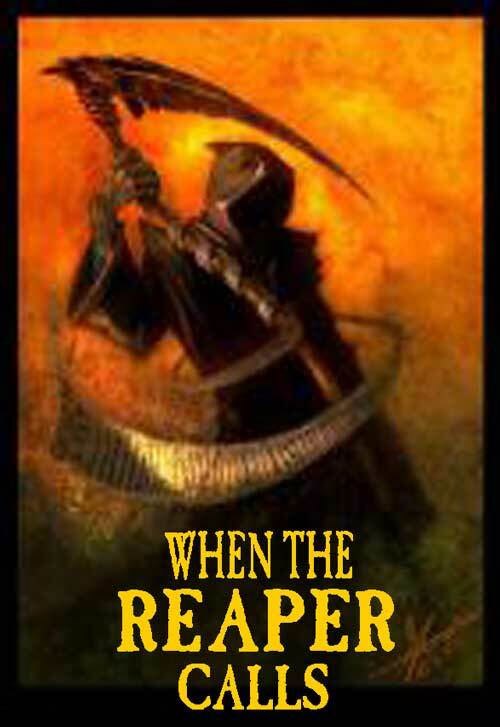 "Reaper offers surprises, laughs, truth"
"I studied philosophy at University so the play is an absolute gift." The Lighthouse Theatre, Meaford Opera House, City Playhouse, Vaughan Tour - 2011. The above email address is a graphic so that SPAM email harvesting programs cannot see it. You must manually type in the email address! Thanks!